The perfect Valentine’s Pops! The program examines the phases of love and relationships: Wanting, Wooing, Playing Hard To Get, Loving and Marriage. Baby, it may be cold outside, but it’s a grand night for singing in the hall. 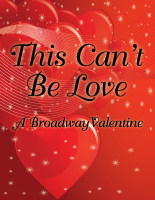 Review: Philharmonic delivers grand night of singing: "This Can't Be Love… A Broadway Valentine"